CLAW envisions a connected network of habitat throughout the Santa Monica Mountains, and beyond. For thousands of years, wildlife has been traversing the Santa Monica Mountains along well-established migratory patterns in order to find food, water, shelter, and mating opportunities. As urban sprawl spreads through this region, access to these routes becomes blocked or dangerous. Without connectivity between habitat blocks, animals have reduced access to food and mating partners, which threatens their ability to survive. Freeways, roads, buildings, and fencing create barriers to animal movement, causing the remaining undeveloped land to become isolated "islands" of habitat. Unable to expand into new habitat, territorial animals may fight and kill each other more frequently. Inbreeding occurs, which negatively affects the local gene pool. 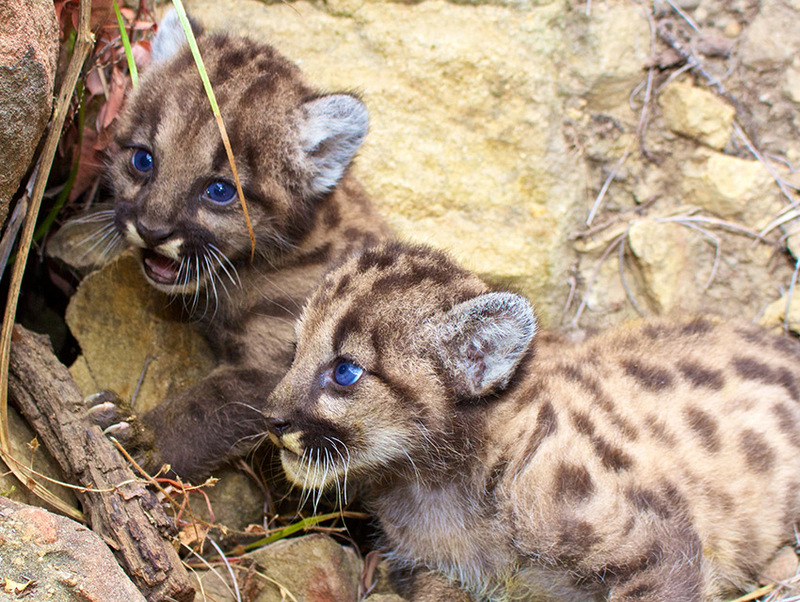 Mountain lion siblings P-59 and P-60 may face health issues as a result of generations of inbreeding. Their father is also their grandfather, great-grand father, and great-great-grandfather. Animals become pushed out of their natural habitat, becoming nuisances in our neighborhoods, and risking collisions with cars. In 2016, over 100 mountain lions were killed by traffic collisions. That year, Californians spent $276 million in property damages and personal injuries due to collisions with over 7,400 animals. Escape routes from wildfires may disappear. If the local population does not survive a fire, the animals will not be able to return to the affected habitat and repopulate the area. As climate change continues to increase the occurrence of extreme weather events, habitat fragmentation will make it more difficult for animals to adapt and survive these challenges. In order for our wildlife to thrive, we must maintain and restore habitat connectivity as we continue to grow and urbanize. This can be achieved through wildlife corridors, pathways that connect healthy "hubs" of habitat. CLAW is taking a multi-pronged approach to protecting connected habitat blocks and wildlife corridors in Los Angeles. Wildlife Corridor Ordinance: CLAW successfully advocated for the City of Los Angeles to designate the eastern Santa Monica Mountains (between the 405 and 5 Freeways) as LA's first Wildlife Habitat Linkage Zone. Any new housing within this region must be developed in a way that does not impinge on wildlife movement or existing corridors. Land Acquisition: CLAW and partner organizations fundraised over $1.6 million to acquire 17 acres of critical connective habitat in Laurel Canyon in our Let's Buy A Mountain campaign. CLAW's nature cam documented the use of this land by multiple species of animals, including mountain lion and gray fox. This land, one of the largest parcels in the eastern Santa Monica Mountains, is a keystone portion of an established wildlife corridor. Conservation Easements: CLAW is in the process of securing conservation easements on multiple pieces of land in the Santa Monica Mountains. These easements are binding agreements that ensure the land will remain natural and undeveloped in perpetuity. Corridor Watchdog: In April 2018, CLAW filed an appeal against the approval of an 8,000 square foot house planned for development over an ecologically unique hillside stream area with multiple protected trees. The Los Angeles Planning Department failed to properly evaluate the importance of this land as a wildlife corridor connecting two crucial habitat hubs. CLAW is monitoring the development of important connective habitat throughout the city to ensure that our planning process gives full attention to the mitigation of habitat fragmentation. On April 19th, 2016 CLAW delivered a letter to LA City Council. Ten additional organizations representing more than 380,000 wildlife activists and habitat protectors joined in our advocacy. Read the full letter here. Corridor Watchdog: Support our efforts to ensure LA City Planning is taking wildlife corridors seriously. CLAW is appealing the approval of an 8,000 sq ft house on a wildlife corridor with a hillside stream in Nichols Canyon. You can add your voice to the appeal using our form. CLAW has hired independent legal counsel Chatten-Brown & Carstens for this appeal. Please consider donating to support our efforts. Conservation Easements: Do you own land that you would like to keep protected for wildlife habitat? A conservation easement protects land in perpetuity, and may result in a tax benefit for the landowner. Contact us for more info on entering into a conservation easement agreement with CLAW. Wildlife Corridor Ordinance: In 2016, LA City Council voted to pass the Wildlife Corridor Ordinance (See "What CLAW is doing" above for more details). The details and implementation of this ordinance are currently in the works, and public hearings may be held soon on the topic. Please sign up for our email list at the bottom of this page to be kept abreast of these hearings, so you can add your voice and show your support! Look at a map of your property and consider whether it facilitates wildlife movement between nearby open space. If your house may be blocking connectivity between habitat hubs, consider making changes to your fencing or landscaping in order to better accommodate wildlife movement. Remove any barbed wire, razor wire, or spikes from your fencing, as this can lead to the injury or death of wildlife. If you would like to protect natural land on your property, consider a conservation easement. This is a binding agreement that a given portion of land will never be developed upon. Volunteered conservation easements may provide you with a tax benefit. Contact CLAW for more info.